Published vide G.S.R. 1274, dated 19.8.1970, published in the Gazette of India, dated 19.8.1970. 1. Short title .—These rules may be called The Foreign Marriage Rules, 1970. (d) “section” means a section of the Act. 3. Particulars regarding name, etc., of Marriage Officer to be displayed in his office building .—Every Marriage Officer shall arrange to have his name, designation and the working hours of his office to be written in English, Hindi and the language of the country, place or area in which he functions as such, and displayed in a conspicuous part of the building in which his office is situated. 4. Notice of intended marriage .—(1) When a marriage is intended to be solemnised under the Act by or before a Marriage Officer, the parties to the intended marriage shall give notice thereof in writing in the form specified in the First Schedule to the Act to such Officer either in person or by registered post. (iii) State or States in India to which the parties or, as the case may be, the Indian party, to the marriage belong or belongs. 5. 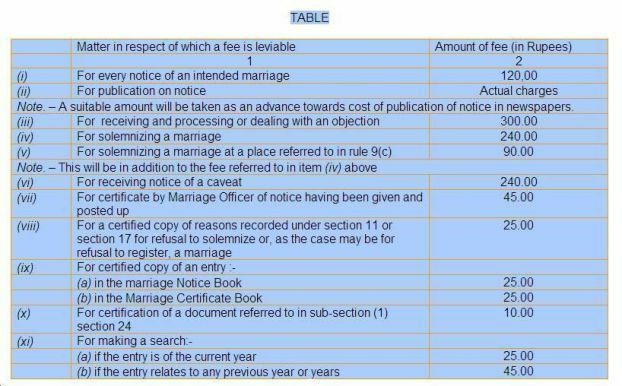 Payment of fee .—(1) Where the notice is delivered in person, the fee prescribed therefore in rule 15 shall be paid in cash to the Marriage Officer. (2) Where the notice is sent by registered post, the fee shall be remitted by money order at the remitter’s expense and the receipt issued to the remitter by the post office through which the remittance is made shall be attached to the notice. 6. 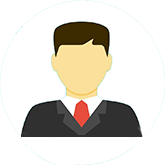 Procedure after notice .—(1) As soon as the notice is received by the Marriage Officer, a distinctive serial number shall be entered on it and such number and the date of receipt of the notice shall be attested by the signature of the Marriage Officer. 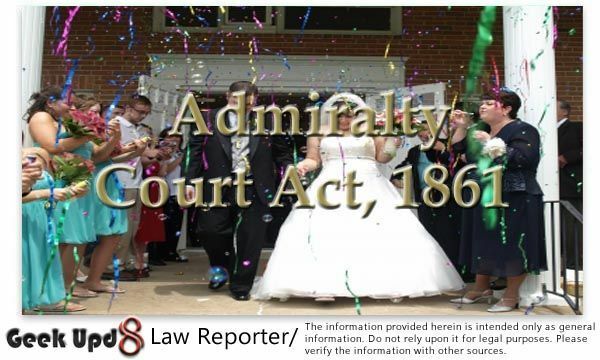 (2) If the notice is in conformity with the requirements of the Act, it shall be entered in the Marriage Notice Book which shall be a bound volume, the pages of which are machine numbered consecutively with a normal index attached. (3) If the notice is not in conformity with the requirements of the Act, it shall be rectified by the parties if they are present, or returned to them by post for rectification and retransmission within a date to be fixed for this purpose, if they are not present. (4) The Marriage Officer shall have every item of rectification attested by both the parties. (ii) in the country or countries in which the parties are ordinarily resident. 8. Procedure for inquiry into objection .—(1) If any objection to the solemnisation of the intended marriage (together with the fee prescribed therefore in rule 15) is received by the Marriage Officer, he shall record the nature of the objection in his Marriage Notice Book and fix the date and time for inquiry into the objection [and cause notice thereof to be served, personally or by registered post acknowledgment due, in Form I on the person] who has made the objection and also the parties to the intended marriage. (2) On the date so fixed or on any other date to which the inquiry may be adjourned, the Marriage Officer shall make an inquiry into the objection and record in his own hand in the manner prescribed in the Code of Civil Procedure, 1908 (5 of 1908), the evidence given. Provided that additional fees as specified in rule 15 shall be payable for the solemnisation of any marriage at a place referred to in clause (c). 10. Manner of registration of marriages .—Registration of a marriage under section 17 shall be effected by the Marriage Officer by entering a certificate of the marriage in Form II in the Marriage Certificate Book. (ii) the statement of the reasons for which the Marriage Officer refused to solemnise or, as the case may be, register the marriage. 12. Language for purposes of section 24.—The language for purposes of sub--clause (ii) of clause (b) of sub-section (1) of section 24 shall be English, Hindi or any other language, approved by the Marriage Officer. 13. Transmission of copies of entries in marriage records .—The Marriage Officer shall send to the Secretary to the Government of India, Ministry of External Affairs, New Delhi, three true copies certified in Form III of all entries or corrections made by him in the Marriage Certificate Book at intervals of three months on, or as early as possible after, the 1st day of January, April, July and October in each year and one such copy shall be transmitted by the said Secretary to the Registrar-General or to each of the Registrars-General of Births, Deaths and Marriages of the State or States in India to which the parties to the marriage belong. 14. Form of Marriage Certificate Book .—(1) The Marriage Certificate Book shall be a bound volume. The pages of which are machine-numbered consecutively with a nominal index attached. Every marriage certificate entered therein during each calendar year shall be consecutively numbered and every authenticated copy of a certificate issued to the parties shall bear the number and date, month and year in which the certificate was entered. (2) For the removal of doubts it is hereby provided that the Marriage Certificate Book maintained under the Special Marriage (Diplomatic and Consular Officer) Rules, 1955 may be continued to be used with necessary adaptations as the Marriage Certificate Book for the purposes of these rules and the Act.